On Saturday December 12th, Pacific Ridge's Upper School Robotics teams, the Ridgebots and the Pyrobots, traveled to Escondido for the first of four league matches in the FIRST Tech Challenge season. This year's game, "FIRST Res-Q," requires robots to climb a mountain to rescue climbers, clear debris, and activate a signal. 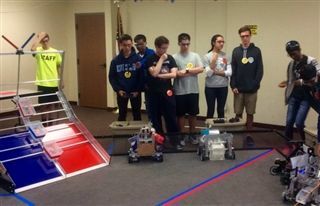 The Ridgebots were undefeated in the tournament's six matches and earned a maximum of 12 qualifying points toward the league championships in February. The Pyrobots overcame a series of mechanical issues to win a majority of their qualifying points and four out of their six matches. Congratulations to both teams on a very successful first match!